If there is still any question out there as to whether or not Bradley Cooper deserves his somewhat unexpected Best Actor Nomination, I'll answer. He does. He came in and edged out Jake Gyllenhaal (Nightcrawler) and David Oyelowo (Selma), and I just can't argue. This is Cooper's third Oscar nomination in as many years, and this is his most convincing work yet. As Chris Kyle, "the deadliest sniper in U.S. Military history," Cooper drives a film that requires just that...drive. It is a role that proves just how good he is as an actor. He can seemingly do anything. And Kyle is so much more than his reputation as a killer would suggest. I am grateful for that. Chris Kyle came from Texas, the oldest son of a hard, yet loving father. As a young man, he lived the life of a cowboy. Riding bulls, drinking beer, chasing women. At 30, he was already an old man when he joined the Navy and made his way up the ranks as a member of the elite Navy SEALs. The early scenes of this movie build this character with immense skill. The editing team of Joel Cox and Cary Roach win the Oscar if I have a say-so (sadly, I don't). The opening sequence of this movie will be familiar if you've seen the trailer, but its the transition out of that and into the chronological structure of this story that get you hooked. Cooper's chemistry with Sienna Miller, who plays his wife, Taya, is what drives the reality of this story home. Their meet-cute at a bar near the San Diego training site of his SEAL team is of the finest I've seen. It is charming and perfect and their quick romance is totally believable intercut with scenes of Kyle's final days of training as a sniper. For the rest of the runtime, their lives are mostly apart. The war rages and each time he returns home, her love for him grows as the light in his eyes fades. His eyes are a major motif here. Strong and piercing and changing. The war scenes in this film are the best of any movie I've seen in years. Earlier in the year, I saw a film called Fury, which was unflinching in a more nonhuman way. This movie finds the balance between war violence and humanity. The relationships Kyle develops with his fellow SEALs and the Marines on the ground are fully developed and real. The chemistry between Cooper and brothers-in-arms Marc Lee (Luke Grimes) and Biggles (Jake McDorman) is as powerful as that which he shares with Sienna Miller's Taya. Credit to Director Clint Eastwood for this. Eastwood really needed this one after he seemingly phoned-in his effort on last summer's Jersey Boys. This is a work of a steady-handed pro. 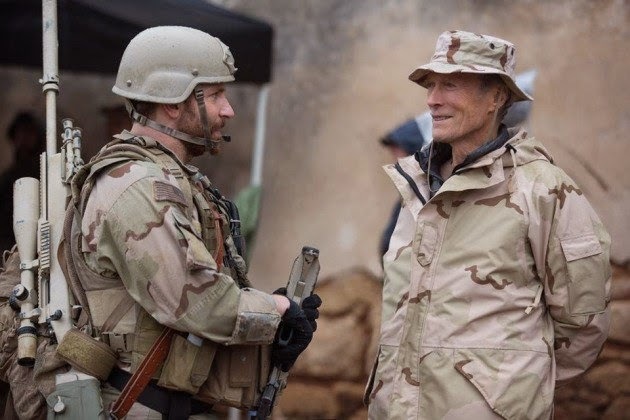 Eastwood continually proves, and even now at 84-years-old, that he is one of the best studio directors we have. 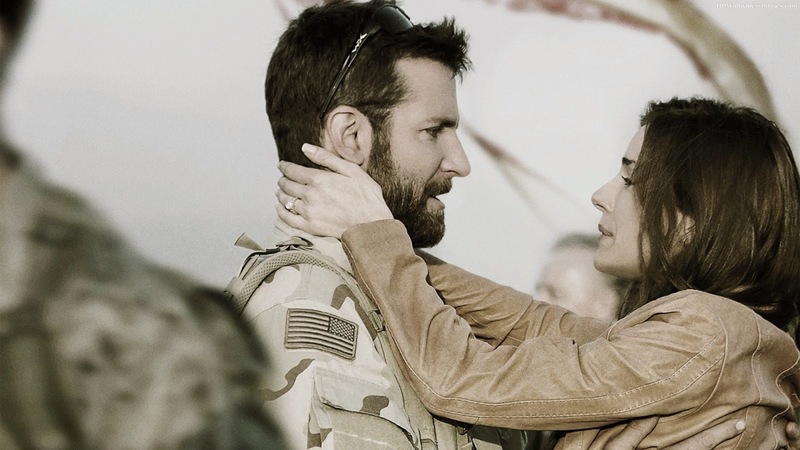 American Sniper is the most fully-realized story of war that I've seen since Steven Spielberg's Saving Private Ryan and Terrence Malick's The Thin Red Line (both WWII dramas, totally different, released in 1998). Like those, its intensity grabs a hold of you like a vice and never lets go. Needless to say, I admire this film. It will most certainly end up on my Best of 2014 list. And I have to give it one more bit of praise, but I can't be specific. I can only say that I have never felt anything like the way I felt walking out of this movie as the credits rolled. When you go (and you must go to a theater for this one), you'll know what I mean. That experience alone is more powerful than anything I've experienced this year. A hero is defined as a PERSON admired or idealized for courage, outstanding achievements, or noble qualities. 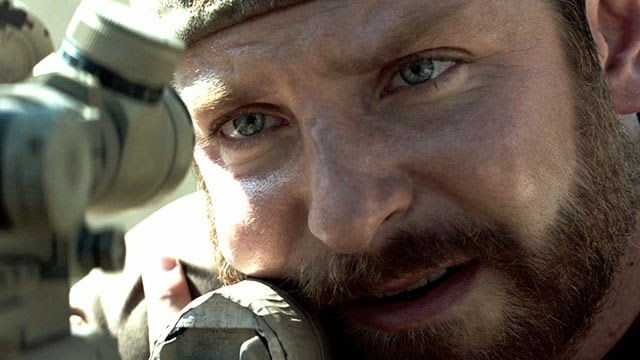 Clint Eastwod's American Sniper, driven by a powerful performance from Bradley Cooper, reminds us of this. We have heroes in this country. Few more truly so than Chris Kyle. I really need to see this. Alex and you now are raving it, despite all the backlash so many naysayers are laboring all over this for stealing Selma's thunder. I hate when an award nomination clouds genuine opinions of a film. I can't wait to weigh in. Great review, heartfelt and honest. Keep up the great work, buddy! Thanks man. I've read quite a few negative reviews of this movie, and I don't get it. It's really powerful stuff, man, and, despite what we know of Eastwood's political beliefs, nothing here is heavy-handed. This material is handled with care and precision. Can't wait to hear what you think. As for it stepping over Selma a bit, I agree that there were some misses as far as that film goes, but this one certainly deserves a spot. I, for one, appreciate Cooper's determination in this role and found it more powerful than Oyelowo's work in Selma. That's just me. I had no idea when I wrote this piece on Saturday afternoon how much vitriol this movie would end up inspiring in people when I started surfing around on Sunday morning. Goodness! My advice to you is to stop reading it, and go see this movie for yourself. It may be too late. I hope not. Glad I saw it before the crazies came out. Oh, I'm so with you on seeing a film before passing judgement...and I don't read into all of that mess that circulates. I saw a few posts and avoided the rest. I don't have time for that. LOL. I'll see the movie for myself, and then I'll know how I feel. Regardless...we are all entitled to our opinions, so whether I love this film or hate it, your review is TOP notch, and your cynicism post you just posted is one of the best blog posts I've read in a LONG time. Thanks, man. I had to get it out there. It was driving me nuts. "But the power of this movie is not derived from the kills but from Kyle as a man. A man with a wife at home and kids being born and growing up..."
YES, exactly. THAT is what this film is about, and I love it for that reason. Great review here, Kevin. Really happy to see that we're right in line on this one. Thank you, Alex. That means a lot coming from you. There is so much unsubstantiated hate for this movie right now it is astounding. I don't get it. This is a classic Hollywood war picture, plain and simple, with plenty of heart and an emotional center (powered by Cooper) unmatched by any other movie about the Iraq War. I feel sorry for people blindly eating up the cynicism of others. Saw this over the weekend and I hate to say it, but I think many of the negative reviews were written in advance, based on the source material and the person directing it. Of course a film based on it's subjects own autobiography won't be entirely clear-headed about all the issues inherent in the material, especially since the subject was killed (in an ironic twist). The way the end turns Kyle into a martyr is overdoing it a bit, but overall I thought the film was strong, and walked the very fine line between glorifying the man and demonizing war in general pretty well. Whatever Kyle's protestations in the film (and Cooper is excellent), it's clear that he's been more than a little fucked up by his experiences as a SEAL. It's more insightful about the mindset of the people who go into the armed forces nowadays than any film I can think of, and for that alone it's worthy. Yeah. I am having some major issues with the way this movie is being blasted, seemingly by people who haven't taken the time to actually go see it. I, for one, am willing to judge a movie based on craft and reaction alone. The ugliness of some of the commentary on this movie needs to stop. I'm as liberal, politically, as they come, and I truly see this is a classic Hollywood war movie. That's it. You are so right on about this movie being true to a mindset. I have close friends who fought over there and came back with the same exact demeanor presented so well by Bradley Cooper as Chris Kyle. I hear you on the end, but I still felt it was powerful. My experience leaving the theater with a capacity crowd will prove unforgettable. This post caught my eye, because I just reviewed this movie too, and it's a film I've been thinking about a lot. I think the hate for this movie has nothing to do with the film itself and everything to do with people's fresh anger and confusion over the war. I am baffled as to why people can't separate the two. I love this review -- I think you did a wonderful job of capturing what makes this a wonderful film. Love this ---> "This movie finds the balance between war violence and humanity. The relationships Kyle develops with his fellow SEALs and the Marines on the ground are fully developed and real. The chemistry between Cooper and brothers-in-arms Marc Lee (Luke Grimes) and Biggles (Jake McDorman) is as powerful as that which he shares with Sienna Miller's Taya." YES ... so true! And based on what I've gleaned from reading and talking to people who have served, when you're out on the battlefield, politics means nothing. It's all about stepping up and protecting your comrades in arms. Thank you so much. I have no problem separating my politics from the movies, for the most part. Not once did I question the power of this movie, even though I am against the War in Iraq. That doesn't diminish the fact that I am fully grateful for those, including some of my close friends, who have served over there.